England recovered from 51/3 at one stage to end Day 1 of the third Test in Mohali at 268/8 thanks to Jonny Bairstow's gritty 89 run-innings at the bottom. For India, Umesh Yadav, Jayant Yadav and Ravindra Jadeja took two wickets each while Mohd Shami and R Ashwin claimed a scalp a piece. India suffered a big blow even before a ball was bowled as KL Rahul was ruled out of the team after aggravating the hamstring injury he had suffered during the New Zealand series at the nets on Friday. Debutant Karun Nair took his place in the team, but India were left with an opener short and might have to look to Parthiv Patel to partner Murali Vijay at the top. England won the crucial toss and chose to bat first on a pitch which is expected to deteriorate pretty fast. Alastair Cook and Haseeb Hammed got their team off to a decent start before India made inroads into the English batting lineup. From 32/0, England were down to 87/4 in the space of 16 overs. Cook received an early respite when Ravindra Jadeja dropped him at third slip. The England captain was looking to work a good length delivery of Mohammed Shami to the leg side, but he only managed to produce a sharp edge towards the slip fielders. Jadeja, who is usually an outstanding fielder, was surprised by the pace at which the ball arrived and could not hold onto it. Despite the scare, Cook played a lot positively and was hitting boundaries at ease. 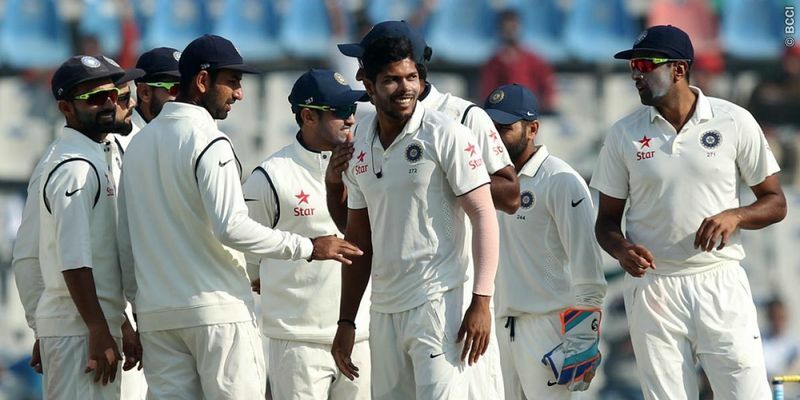 On the other hand, Umesh Yadav, who was in the middle of a brilliant spell, received a warning from the umpire for stepping into the danger area of the pitch in the eighth over. But that did not put Yadav off, who continued to extract a lot of seam movement off the track. Eventually, the Indian pacer got his reward as a good length delivery to Hameed bounced viciously and took the southpaw’s glove before settling into the hands of Ajinkya Rahane at gully. Cook received another lease of life in the 11th over as Ravichandran Ashwin dropped a simple catch at midwicket, and he sprinkled some salt on Shami’s wounds by hitting the next ball to the boundary. However, his luck ran out soon enough as England lost two wickets in two consecutive overs. Jayant Yadav dismissed the dangerous Joe Root with a delivery that did not bounce as much as the Englishman expected and caught him plumb in front of the wickets. In the next over, Ashwin, who dropped Root 10 minute back, dismissed the English skipper with his very first delivery of the match! It was a short and wide delivery and Cook attempted to cut it through, but ended up giving a faint edge to the keeper. England were left trembling at 51/3. Jonny Bairstow and Moeen Ali, who was promoted up the order, looked to stabilize the innings, but their 36-run partnership was brought to an end by Mohammed Shami in the 27th over. The pacer dug in a bouncer which induced a top-edge from Ali, and Vijay completed an easy catch. With that wicket, India went into the lunch break with the upper hand having restricted England to 92/4 in the first session. Ben Stokes and Bairstow formed a crucial partnership after the lunch break with the former going after Shami at the start of the second session. But just when it seemed like the visitors were on their road to recovery, Stokes threw his wicket away in a moment of madness. He walked down the pitch to play an ambitious drive off Jadeja and missed the ball completely. Patel was swift behind the stumps and took the bails off in no time. Bairstow kept going at the other end, though. He brought up his half century in the 46th over with a lovely shot through the backward point region off Jadeja. At the other end, he had Jos Buttler for support, who was under a lot of pressure to perform having been drafted into the side in the place of Ben Duckett. The duo kept their heads down and kept the scoreboard ticking to take England past the 200-run mark before the tea break. India found a breakthrough early on after Tea when Jadeja sent back Buttler, who could add just 5 more runs to his total after the break. Jadeja tossed up the ball and Butler could not resist the temptation and ended up drilling the ball straight to Kohli at mid-off. Woakes, who got a call-up to the squad as a result of the injury suffered by Stuart Broad, joined Bairstow at the crease with the scoreboard at 213/6. Woakes and Bairstow set up another good partnership of 45 runs before the latter was adjudged to be LBW on a Jayant Yadav delivery. England reviewed the decision but the batsman was plumb in front of his stumps and Bairstow had to make his way back after a well-made 89. Woakes too was sent back to the dressing room after missing an Umesh Yadav delivery in the second last over of the day. England finished the day at a score of 268/8, but will be the happier of the two sides after recovering from the early losses.